Some of the Best American BBQ Food Ever? Myself and my better half took a trip to Chester this weekend to go to a restaurant she loves, little did I know it would turn out to be some of the most scrumptious food I’d ever put in my freakishly big mouth. Situated directly on the banks of the River Dee in the truly stunning town of Chester lies a American BBQ gem. Hickorys Smokehouse in Chester brings some of the superb authentic dishes from the United States of America right to your plates over here in the UK. We decided to visit on a Saturday night, no booking. It emerged how popular the place is when we were told there was an hour and a half wait for a seating. Not at all phased, we had our names taken and hiked to the pub up the road for some well deserved alcohol. After several cocktails and a bit of the football we headed back to find our table was practically waiting for us, along with some tasty salted popcorn for an appetizer. Salted popcorn is similar to marmite, something that’s not to everyones tastes and rarely mine. There was something about this particular moment that made it altogether delicious however. 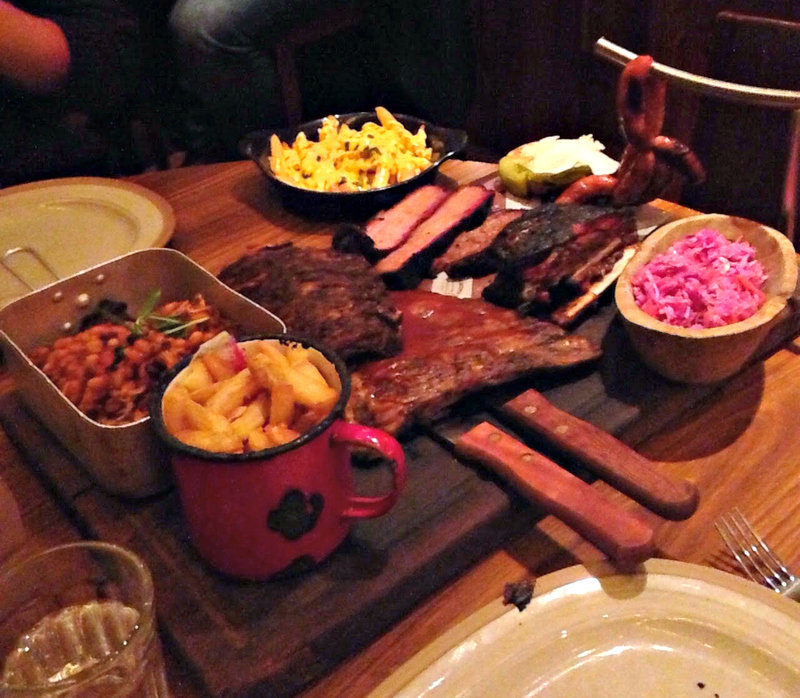 We ordered one of the largest dishes on the menu, Hickorys Smokehouse Platter. It was £35ish worth of BBQ meat on a giant platter to share between 2, and it was amazing.There was 3 different kinds of ribs, pulled pork, sausages and slow cooked beef. Not to mention the fries that came with it and the extra chilli cheese fries we ordered which were simply fantastic! We just about demolished the lot and I felt so full and satisfied I could have had a strong and long food coma nap instantly there on the table. Instead, and like true troopers, we pushed on for desert. Like the children we are chocolate fondu and marshmallows was right up our street. A simple, but visual masterpiece of a dessert. 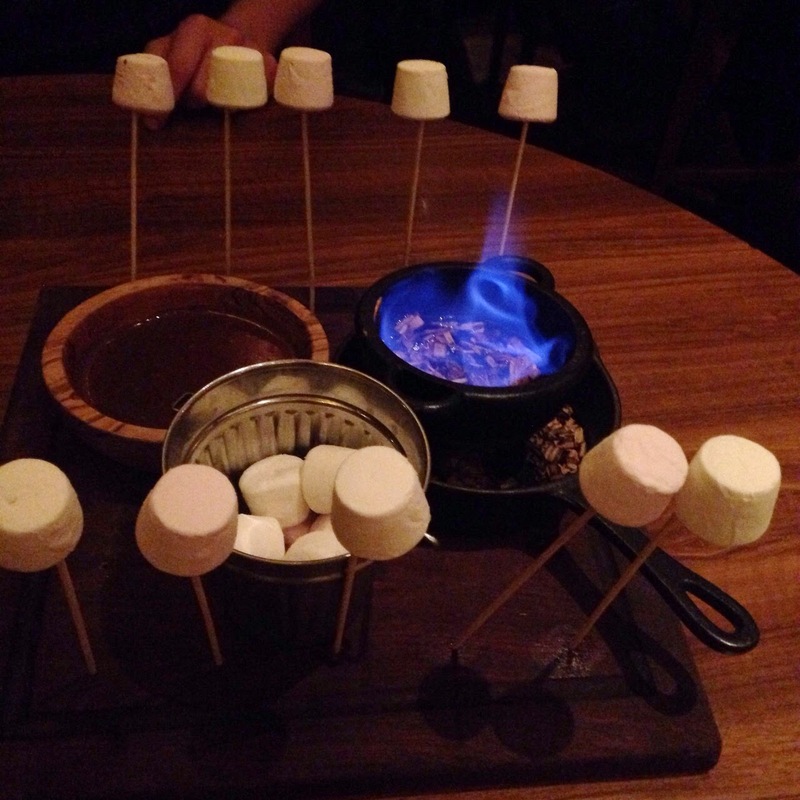 You actually get your own little camp fire with the dessert to cook your marshmallows on, how good is that? Kind of reminds of the days went you went camping with the family as a kid. Marshmallows round the campfire, sort of! If I were to give this restaurant a rating, it would be 5 stars out of 5. Not only was the dinner incredible, but the restaurant staff provided the best customer service I had come across in years. So many places neglect this simple factor of business, but in my opinion it is one of the most important. The staff obviously worked hard to make the customers enjoy their meal and it showed.